We are living in an urban age. According to the United Nations, the balance of people living in cities crossed the threshold of 50 percent in 2008 for the first time in the history of the planet. By 2050, it is estimated that more than three-quarters of the world’s population could reside in cities. With such global demographic shifts taking place within cities, combined with the accelerating challenges of climate change, it would be easy to be pessimistic about the future. 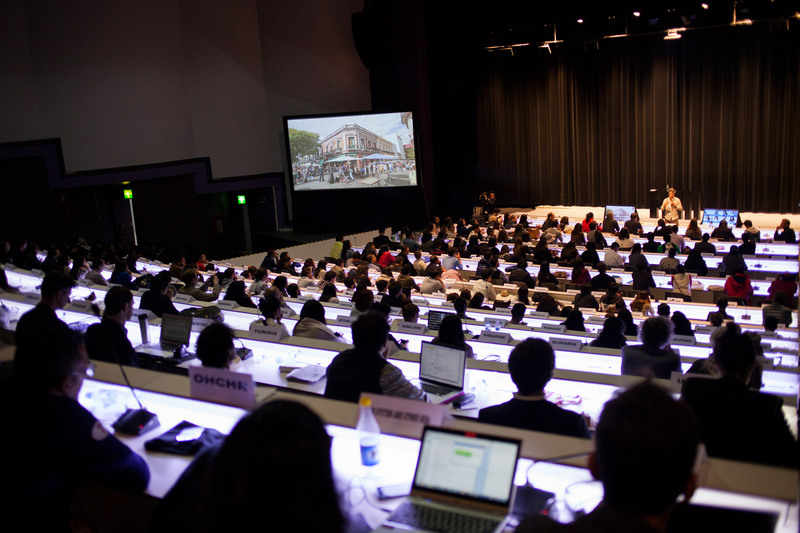 The UN conference Habitat III, which took place in Quito, Ecuador, from October 17–20, was a key moment in which the global community embraced the idea of urbanization as a positive agent of change in human development. Occurring only once every 20 years, the conference collects some of the world’s most influential policy makers, politicians, press, designers, researchers, experts in sustainability, and interested onlookers on issues surrounding housing and sustainable urban development. This year there were 45,000 participants, the greatest number ever to attend. Many of the thousands of participants appeared to be local Quiteños who had managed to register in time and had braved the long lines. The week was hectic, busy with visitors clamoring to attend panel discussions, visit exhibitions, and listen to lively discussions. The audience was filled with intrigue and anticipation, teetering on frenzy—there was so much to do and so many important conversations to absorb and participate in. The positive outlook continued into the conference and throughout there was a series of exciting conceptual revelations that shifted the discourse on the evolution of cities. It started with recent Pritzker Laureate Alejandro Aravena’s keynote speech at the end of the first day, where he extolled his belief that the moment had come to invert our notion that good cities only come about after the creation of wealth and prosperity; to one where good cities lead by setting the context for economic development—an idea he borrowed directly from Dr. Joan Clos, executive director of the conference. Then there was the hugely anticipated release of the Atlas of Urban Expansion, a collaboration among New York University, UN-Habitat, and the Lincoln Institute of Land Policy. After years of analyzing satellite data, Professor Shlomo Angel and his team revealed conclusive proof that the footprints of cities are expanding faster than their populations. LSE Cities and Deutsche Bank’s decade-old Urban Age program explores how the physical and social are interconnected and enter the collective conscience. The New Urban Agenda’s mantra of “urbanization as an engine of sustained and inclusive economic growth, social and cultural development, and environmental protection” with its “potential contributions to the achievement of transformative and sustainable development” seems irrefutable and was adopted by all member states. However, just because it is written does not necessarily mean it shall be. Reality is unpredictable. Ominously, on the final day of the conference, after days of a smoothly run operation, there was a sudden power outage. The whole complex of the Casa de la Cultura Ecuatoriana, where the majority of the conference was located, was temporarily thrown into darkness. As people exited the dark lecture theaters, eyes squinted against the bright sunlight, rumors circulated that there were power surges causing explosions on the grid and that the city was without electricity, perhaps even the whole country. An hour or so of presentations, though written weeks before, were wiped from existence. Leaders often turn to architecture to make concrete ideas that are, in reality, abstract constructions and Dr. Clos was no different in this regard when he asserted that the New Urban Agenda is contingent on “three pillars” of development: the rule of law, good design, and a sound financial plan. By the end of the conference they were being expounded almost as if they were fundamental laws of nature: “Without these three pillars in a good manner, well balanced, we don’t have good urbanization. You can have excellent project design of two pillars but if … any one of them fails, all the systems fail.” Unsurprisingly, architects across history have been among the biggest exponents of using architectural rhetoric to imbue an underlying natural order to their ideas. Though Dr. Clos is an epidemiologist by training, his image of three pillars conjures the spirit of the likes of Vitruvius, Vignola, and Le Corbusier. Though subsequent societies came to recognize these men’s “laws,” as polemical constructs, now that the New Urban Agenda has been adopted it would seem that Dr. Clos’s words have become a fixed reality for many. Aravena has an enthusiastic belief in these laws. In fact, his practice, Elemental, provides the perfect example of the three pillars at work. In his evening Urban Talk, Aravena explained the financially sustainable building models his practice develops that allow the construction of homes at scale. He informed us that crucial to his projects, in addition to the relationship between the state and the market, a third element is utilized: the capacity of the people themselves. This dynamic, exemplified in his Incremental Housing concept, is where people expand on their homes within a preset framework when they have the means. Aravena’s model exemplifies how good design enables people who start with nothing to become property owners and even sell and reinvest. This goes to the heart of a key idea pervading the New Urban Agenda. Bundled up in the preeminence of the city is an ideology that increasing land values will unlock wealth and prosperityfor all, in what the president of the Lincoln Institute for Land Policy, George McCarthy, said is a virtuous cycle: “… when new investments made in infrastructure and services increase the size of the tax base, and increase the value of the land, it becomes the source of new own source revenues and those revenues become available to make new investments…” Essential to delivering on the New Urban Agenda is a strategy based on market economics. In this context, fears over the right to the city are understandable. With growing inequalities in urbanized and urbanizing regions, how can the prosperity of the many be guaranteed? It is possible to have come away from the conference believing that the world’s leading thinkers on urbanization were broadly in agreement about their faith in the strategies underlying the New Urban Agenda. Except, beyond the high fences and security barriers protecting the Habitat III venues, other events were taking place that ran counter to this, such as “The Alternative Habitat,” organized by activists, community organizers, and researchers who felt left out of the official process. Invisible from any official program, the geographer David Harvey gave an energizing talk at the university on the Right to the City. But how might the rule of law be enforced? The foregrounding of these ideas will have fundamental impacts on the development of cities and their architectures with potentially dangerous unintended consequences. When Clos dictated that “… the natural form of spontaneous urbanization is the slum,” it seemed clear that his insistence on the rules of law is most acutely directed at developing nations and their regions of rapidly expanding informal settlements. What troubles him is that in the coming years, developing countries will provide the greatest growth. Current UN estimates show that Africa alone will account for 54 percent of global population growth by 2050, the majority of which will bein cities. These are precisely the places where the social contract is weakest, making the rule of law, regulation, and planning the most difficult and antagonistic to implement. So, if the price of establishing the New Urban Agenda is expropriating land and increasing municipal revenues by imposing new, ever-inventive forms of taxation that also target the poor, without addressing Pieterse’s pertinent point about securing jobs, then UN-Habitat might inadvertently be framing the city as the territory of a battle between elite policy makers, planners and politicians, and the urban poor.